Foothills surround the valleys and farms of my childhood. While farms were a part of my life I was never a farm girl. Even being raised ‘out in the country’ I am unsure I was ever meant to be a country girl. I remember many afternoons sitting on my great grandparents’ porch on their farm. Snapping beans and shucking corn. Oh how I hated those chores. Temperatures were hot and I would rather have been reading. Escaping into a fictional world where I was a princess. I live in a small town now. No longer the southern belle living near the farmlands. However there are aspects of the country I miss. Especially when I return to visit my parents and am reminded how a part of me will always belong amidst the roads and paths of the farmlands and countryside. The Appalachian foothills that look almost blue on a sunny day. 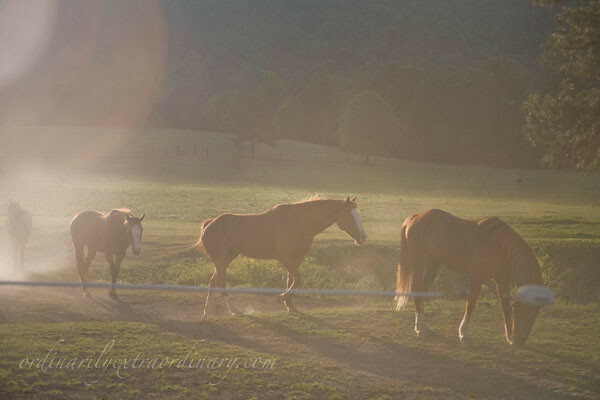 The horses grazing at a neighbor’s farm. The cows bellowing at my uncle’s farm. The sounds of night are always better there. The pollution of noise and light confined to the city fifteen miles away. Only the occasional car passing by instead of the busy highway. Stars twinkle brighter and constellations reveal themselves with less apprehension than near the city. Frogs croak louder and crickets chirp faster. The nocturnals call out from the forests. At night I sit on my porch here at the edge of our small town. I gaze at the stars although they don’t twinkle as brightly. I listen to the frogs and crickets although the sounds of the highway muffle them somewhat. And I remember. I remember what I love about the farms and countryside. As we discussed the other night, the sounds of nature are like a soundtrack to “being still” for me. I miss the nightime chirping of crickets and frogs, and I still love the early morning birds. The sounds of God’s creation are just amazing. Thanks for a beautiful word picture, Amy. Ahhhhhh…This was the perfect post to read late in the evening. Like Carl said, the word picture you’ve painted is exquisite. Thank you for the gift it is and for the gift you are.